I obtained a bullet mold from Ralph Huffaker that is like the original .476 Eley. Ralph decided to resurrect the obsolete .476 Eley in it's true form. He had Lee Precision make a custom mould to his dimensioned drawing of the original 288 gr. .476 bullet used in the Army pistol trials of 1904. Ralph was kind enough to sell me one of the molds after we determined it would work in the 480 Achilles. The mold casts a bullet of .473" in the main body, and .453" diameter heel. The heel is .200" long, with crimp groove .020" deep. 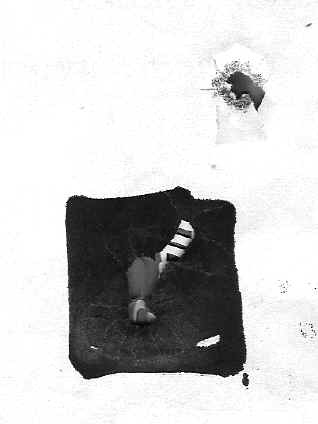 Tests showed that the bullet would expand to the rifling very easily, and that it would engage fully in the rifling. I finally got a chance to run some over the chronograph and also to shoot some targets. All loads seemed fairly accurate ... 2" or less at 25 yards. Several loads showed real promise .. 7 gr. Unique and 24 gr. Black Powder. The target above was shot with the black powder load. The ones in the black are 3/4" center to center. My first shot with black powder was after shooting about 100 rounds of smokeless and it went way outside the group. (it's not on the paper) My second shot was high. The last 3 I could not see and thought I was missing until I walked up and saw the group. More testing is in order. These bullets tend to penetrate like crazy! I tried shooting into 9 layers of carpet and the bullets just whizzed right through and on downrange. I finally laid all the carpet on top of a 4 x 4 and a 2 x 6. I fired into it and the bullet was laying on top of the ground UNDER the 2x6!! The bases expand evenly on all loads. 24 gr. is as much black powder as it will hold. That is level full with the case mouth. When you seat the bullet the powder goes up into the hollow base. More to be done of course.